The logbook stores the logs of your recorded activities. The maximum number of logs and the maximum duration of a single log depend on how much information is recorded in each activity. GPS accuracy (see GPS accuracy and power saving) and using the interval timer (see Interval timer), for example, directly impact the number and duration of logs that can be stored. You can view the log summary of your activity right after you have stopped recording or through the logbook under the start menu. If the log has GPS data, the logbook entry includes a view of the full route track. You can see many more details of your recorded activities in Movescount.com. Keep Start Stop pressed to stop and save the exercise. Alternatively, you press Start Stop to pause the recording. After pausing, stop by pressing Back Lap, or continue recording by pressing Start Stop. After pausing and stopping the exercise, save the log by pressing Start Stop. If you do not want to save the log, press Light Lock. If you do not save the log, you can still view the log summary after pressing Light Lock, but the log is not stored in the logbook for later viewing. Press Next to view the log summary. You can also view the summaries of all your saved exercises in the logbook. In the logbook the exercises are listed according to date and time. Scroll the logs with Start Stop or Light Lock and select a log with Next. 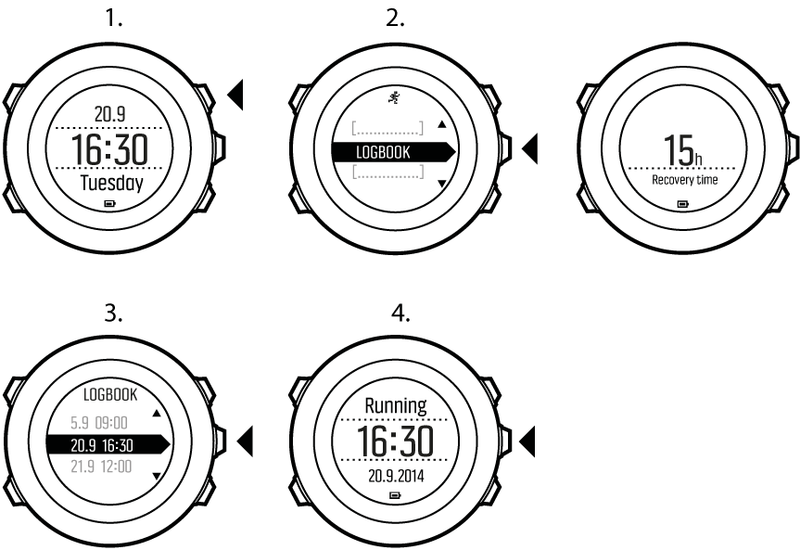 If the log includes multiple laps, you can view lap-specific information by pressing View.